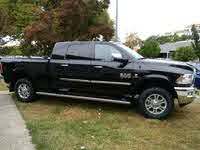 Looking for a New Ram 2500 in your area? CarGurus has 2,272 nationwide Ram 2500 dealers with 33,521 new car listings. When drivers need more power and capability than a typical light-duty truck will offer, the Ram 2500 is the heavy-duty workhorse that lives up to its name. For 2018 Ram buyers get more unique optional looks for the 2500. Ram now offers a Limited Edition Tungsten package for the 2500. True to its name, this package features Tungsten Chrome on the Limited-look grille, wheels, and exterior trim. Inside, the Limited Tungsten edition features a beige leather interior with blue accents. The Ram 2500 is available in a wide range of trims, including Tradesman, SLT, Big Horn, Power Wagon, Laramie, Laramie Longhorn, and the range-topping Limited. The polygon-style grille from the Ram 1500 Limited replaces the crosshair grille, an integral part of Ram design for decades, on several trim levels. 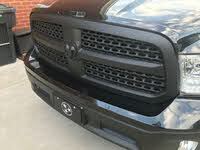 The Power Wagon trim features this new grille, as well as the Laramie Longhorn and the Tungsten. The Tradesman keeps things simple, with black bumpers and grille, quad halogen headlights, manual door locks, and manual climate control. The Tradesman features a basic LCD display for the radio with six speakers.The SLT adds an electronic 4x4 shifter, chrome exterior elements, a sliding rear window, 5-inch Uconnect touchscreen, and Bluetooth connectivity. Moving up in the lineup, drivers can choose from more luxurious trims, such as the Big Horn, which adds 18-inch polished aluminum wheels, remote start, and unique badging. The Limited provides a unique grille design and massive RAM lettering across the tailgate. The Limited also features a full leather interior, heated and ventilated front seats, heated second-row seats, a wall-style power outlet, and an 8.4-inch touchscreen with navigation and voice control. The Power Wagon stands apart from other trims in the 2500 lineup. 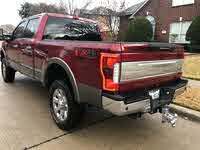 It shines off-road and offers a Warn winch for pulling heavy loads, including lesser trucks or SUVs. Other features exclusive to the Power Wagon include skid-plate protection, Bilstein off-road shocks, off-road tires, front and rear locking differentials, and even a disconnecting front sway bar. 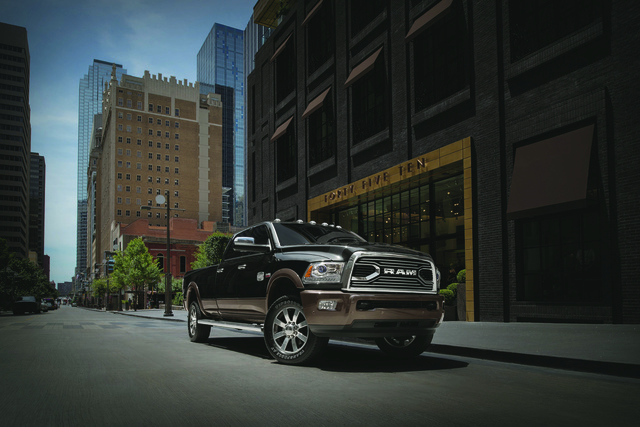 The standard Ram 2500 has a spacious interior with a traditional column-style shifter. It offers ample head- and legroom, and the massive center console provides plenty of storage space. The newly available 8.4-inch Uconnect infotainment screen may look similar to the previous version, but it offers improved resolution and features pinch-to-zoom navigation. It comes with Apple CarPlay and Android Auto and is available with 4G LTE Wi-Fi hotspot capability. The base engine in the Ram 2500 is a 5.7-liter V8, making 383 horsepower and 400 pound-feet of torque. Should drivers want more power, Ram offers a 6.4-liter V8, putting out 410 hp and 429 lb-ft of torque. For the most torque, drivers need the Cummins turbodiesel. It provides 350 hp and 660 lb-ft of torque with the manual transmission or 370 hp and 800 lb-ft of torque with the automatic. The gas engine routes power through a 6-speed automatic transmission, while the Cummins turbodiesel is available with either a 6-speed manual or the 6-speed automatic. Push power to the rear wheels, or choose 4-wheel drive with low-range. The Ram 2500 offers two unique rear suspension systems for the segment: a five-link coil system and an adjustable air-suspension system. When properly equipped, the Ram 2500 Diesel can tow up to 17,980 pounds with a maximum payload of 3,059 pounds. 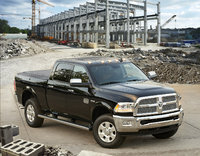 The Ram 2500 can haul up to 16,320 pounds with a gas engine and provides a maximum payload of 3,987 pounds. A reversing camera now comes standard on all versions and joins a list of standard safety features that includes front and side multi-stage airbags, electronic stability control, hill-start assist, and trailer braking and sway control. Other available safety features, such as front and rear parking sensors, make maneuvering in tight spaces easier. Heavy-duty pickups are made to get work done, but they often get asked to do much more. If your day takes you from the work site to the grocery store and practice for the kids, the Ram 2500 Heavy Duty strikes the perfect blend of capability and comfort to make it an ideal truck for all occasions. MSRP for the 2018 Ram 2500 is $32,145 for the base Tradesman trim with the single cab and 8-foot bed. The SLT starts at $36,345, while the Laramie starts at $47,645, and the range-topping Limited starts at $57,775. What's your take on the 2018 Ram 2500? Users ranked 2018 Ram 2500 against other cars which they drove/owned. Each ranking was based on 9 categories. Here is the summary of top rankings. Have you driven a 2018 Ram 2500? Enter your zip to see incentives for a new 2500 in your area. Will 2018 Ram 2500 8 lug wheels fit a 2000 thru 2017 Ram 2500 8 lug wheel? Where is the fuel filter located on a 2018 Ram 6.4L Power Wagon?